Peanut pie is sometimes called “the poor man’s pecan pie.” However, anyone who says so has likely not sampled a slice. While it’s true that some peanuts are small, shriveled, and no match for the richness of pecans, the goobers in a peanut pie are large, meaty, and roasted to a perfect crunch. They often hail from the United States’ Tidewater region, which stretches from southeastern Virginia to northeastern North Carolina. Tapping into the same addictively salty-sweet characteristics of Cracker Jacks and salted caramel, peanut pie became most popular in North Carolina and Virginia—the latter of which continues to boast the most iconic rendition of the dessert. The recipe is simple: Bake a pie crust filled with sugary syrup and a blanket of roasted and salted peanuts. 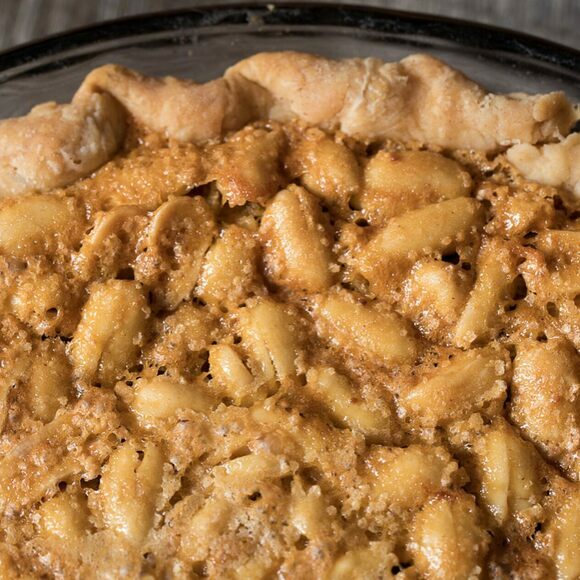 In the years since the pie’s inception, cooks have played with this basic outline, adding cayenne pepper for heat, chocolate chips to invoke a Reese’s peanut butter cup, and vanilla extract or bourbon for a full-bodied, aromatic finish. The finished product should always be served warm, topped with whipped cream or vanilla ice cream. If this is the poor man’s pecan pie, one might wonder why they’d bother with the rich man’s version at all. Peanut pie is most popular in Virginia and North Carolina, but a smattering of pie shops and restaurants across the United States also bake it in a variety of styles. "A Legend in a Nutshell Since 1929!" Stationed beside the country’s first commercial peanut farm, this eatery serves up salty-sweet peanut pies with a nutty brittle-like topping.